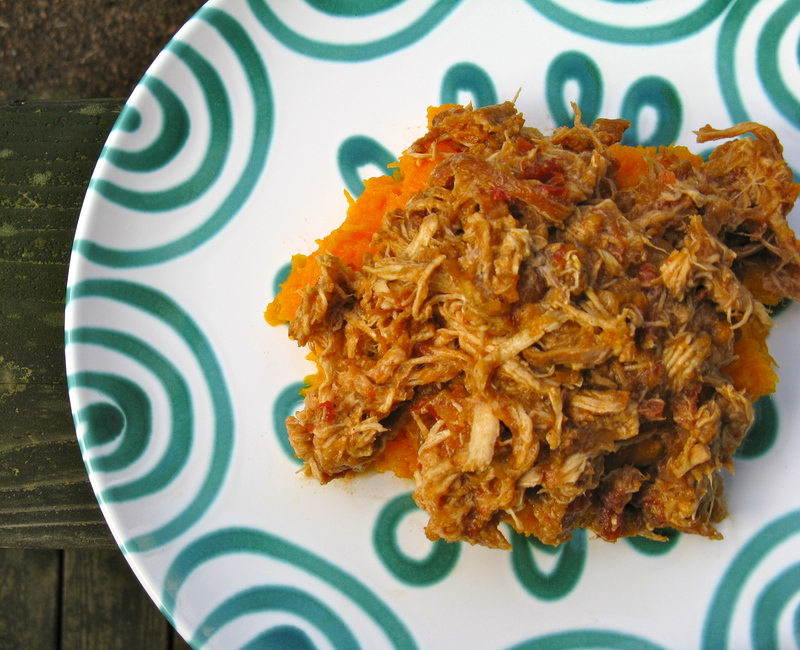 Pull out your slow cooker for this incredible apricot chicken! With some simple preparation, you can have this in your slow cooker in no time, but remember to plan ahead for the cooking time. Speaking of which, are slow cookers anyone else’s saving grace? Such a lifesaver! Plus, I can’t get enough shredded meat. It’s my favorite and this apricot chicken is a newfound love. On another note, what an exhausting, but good week! I am whooped and so glad that it’s Friday. I admit, I haven’t done the greatest with my sleep this week and part of it is due to poor planning. Sure, I had an extra busy week, but most of this falls back on me. I gladly take the blame. Yesterday was especially brutal on the tiredness scale, and I even took a cat-nap before going to work in the evening. I opted to get better sleep last night, put my computer away and got to bed at my preferred time. I’ve got to get myself back on track because things are only going to get more hectic! Melt the 1 tsp of the coconut oil in a pan over medium heat. Season the chicken with sea salt and pepper, and add to the pan. Brown on both sides for a couple minutes. Then, remove from heat and set aside. In the same pan, melt the remaining 1 tsp of coconut oil. Add more if needed. Add the onion and saute a few minutes, until it becomes translucent. Stir in the ginger, garlic, cinnamon and allspice. Cook and stir for 30 seconds, or until fragrant. Add the tomatoes and chicken broth. Cook a few minutes longer, until heated through. Pour mixture into slow cooker and add the dried halved apricots. Place chicken on top of the mixture and cover. Cook on low for 5-6 hours or on high for 3-4. When done, shred the chicken with two forks and mix together. Serve atop vegetable of choice (kale, winter squash, etc.). I used mashed butternut squash. I really like your photo. The shredded chicken LOOKS amazing. However, I have to admit, whenever I try shredded meat, I am always disappointed. I find that most recipes are just too sweet for me. And, I despise cooked fruit – with the exception of tomatoes. This looks incredible! I am a huge fan of my crockpot AND shredded chicken. I’d love to try this recipe! I was looking for an excuse to pull out the slow cooker! I stopped drinking coffee years ago because of its nasty effects and how much it hurt my system. I occasionally drink it now, but only cold-brewed, which my guy makes at home. It has 60% less acid than regular brewed coffee and I haven’t had any trouble with it when we’ve made it at home. It doesn’t require a coffee machine, but you do need a French press. If I were you, I’d opt for green or black tea, just make sure not to oversteep or it’ll taste terrible. About 2 minutes for green and 3-5 for black. I love green tea in the morning 🙂 Tea and coffee have 0 calories. It’s what you put it in that adds calories. I always drink my tea after breakfast, but occasionally before. This was so good! I didn’t have any chicken breasts around so I used some skin on thighs. I browned them skin side down, then reserved some of the fat to saute the onions, etc. Then removed the skin and dumped it all in the crock pot in the order you suggested. It was so amazing! Even my husband who doesn’t like this flavor profile at all, loved it. I served it over cubes of roasted butternut squash (tossed in more of the reserved chicken fat). Had the left overs for lunch at work today! I’m thinking it might be good with beef too…. Or a little coconut milk added at the end…. THANKS fellow Portlander! Any idea if the final product would freeze well into smaller portions? I love making big batches of food and freezing it for lunches to take to work. I’ve never tried freezing it, but I imagine it would work quite well. I don’t see any reason why it wouldn’t work. I say, give it a shot! I made this last week and it was sooooo tasty! I will definitely be making again. smitten with your blog – and this recipe which i am making for the second time tonight! Thanks for the great ideas! and happy birthday! Aw, thanks Kristen. Your words mean a lot and I’m so happy you love this recipe. I appreciate your birthday wishes! I’m having a lovely day so far! Smitten with your blog, and this recipe which I am making for the 2nd time tonight! Thanks for the great ideas! and happy birthday! I have this in the slow-cooker right now! Had some bone-in, skin-on drumsticks so I used half those, half boneless skinless thighs – I’ll pick the skin and bones out later. I also ran short on apricots so i used a few prunes as well. Will let you know how it works! Yes, keep me posted on how things work out! I imagine prunes will work taste pretty good! Made this several times, and love it! Wondering if you have ever done it without browning everything, but instead just throwing it in the crockpot? Trying to save some time! Great, glad you like it! I brown the chicken first because I feel like it adds flavor and locks in the juices, but you can definitely skip that step, especially if you’re tight on time! Can you omit the tomaotes? Will it be too dry? I don’t recommend it, unless you have to avoid tomatoes/nightshades, but I suppose you could omit them. You will probably need to add a bit more broth though and possibly tweak some of the other flavors. There is just something about the combination of apricot and chicken that is downright amazing! This looks like a recipe I’ll need to try! 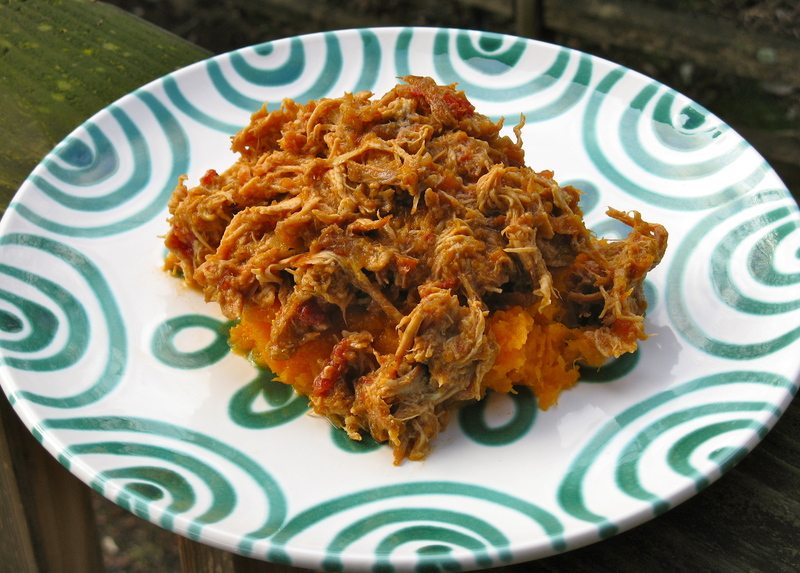 Thanks for contributing your recipe to my 125+ Gluten-Free Slow Cooker Recipes post! Big thanks to you for featuring it, Lydia! I appreciate it. I hope you enjoy the recipe when you try it — it’s had some pretty rave reviews! The first time I tried this I didn’t have dried apricots, so I used what I had: dried apples and dried peaches. It was sweet and delicious. I love sweet things but a little too sweet for my daughter. The day after (leftovers) the liquid really absorbed into the meal and the sweetness depleted a bit. This recipe is a keeper! I’m cooking it tonite (to take to a potluck tomorrow) with the apricots. Thanks for your kind words, Janet! I’m glad you were able to find a tasty substitution when you didn’t have apricots on hand. Gotta work with what you have sometimes. Meanwhile, I hope the recipe is a hit at your potluck! Actually they are totally legit and most definitely paleo. I’m not sure where you got that idea. I love this recipe! I’ve made it frequently. Enjoy your blog.